For some reason I've never really made a lot of pork dishes (bacon doesn't count) because it can dry up so quickly so I've shied away.... well, for a few weeks I've been wanting to try my hand at a pork tenderloin but there was just the matter of finding a recipe that seemed like it wouldn't dry out too much, was easy to make as it was my first attempt and was overall delicious sounding. So, I searched some of my fave sites and then I happened to be reading Katie's blog and saw this recipe in the "you might also like" section. For the most part I had everything I needed at home to try this recipe however I didn't have time to marinate it overnight so I had to adapt. -In small bowl, combine chili powder, garlic powder, paprika, cumin, salt, black pepper, and toss to combine. -Rinse pork loin and pat dry. 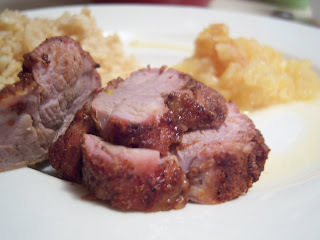 -Rub spice mixture into pork evenly. -Place pork into large plastic bag and pour in orange juice. -Preheat oven to 450 degrees and line small baking pan. -Roast for 15 minutes and reduce heat to 350 degrees. -Roast until internal temperature reaches 145 degrees, about 40 minutes. -Remove from oven, place on cutting board and cover with foil to let rest for 10 minutes. -Carve into slices 1/2 inch thick and serve. What a great combo of spices and the addition of oranges must give it a great subtle sweetness!